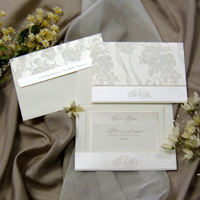 For an affair to remember and a lasting first impression, this all new catalog has it all. 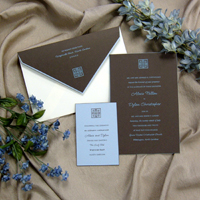 Featured are our new plaque-thick papers in 6 colors that can be used alone, laminated to each other, or to any other paper or fabric and done hand beveled or straight cut edges. New glitter papers in 7 gorgeous colors create endless design choices for all of the events that surround the special day. The color swatch pages showcase a gorgeous, overwhelming selection of exclusive papers and colors. 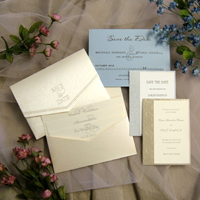 Samples of fabulous "save the date" cards, menus, programs and announcements coordinate with the distinctive wedding invitations. 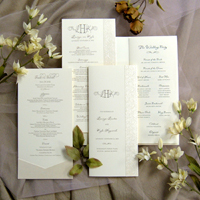 Great new wedding scripts and typestyles are beautifully exhibited in exceptional graphic layouts. 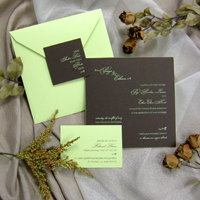 In addition to the numerous invitation sizes displayed, we introduce our new super slim size that creates a fresh new look presenting many great design options and layouts. 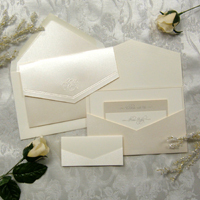 Retail price range $300 to $1200 per 100 invitations.